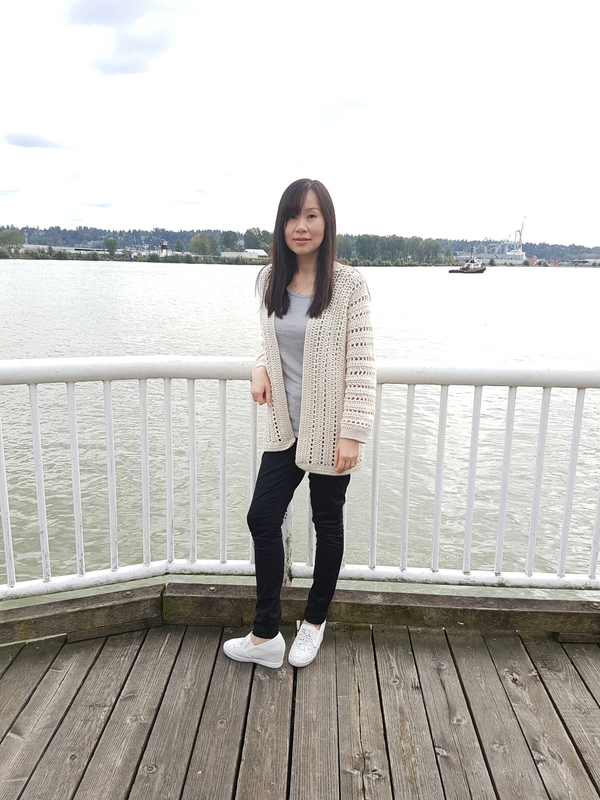 Summer is over, so I decided to design a cardigan that is light enough to wear but gives warmth for that cooler autumn air. I had something simple in mind and after browsing through stores I finally came up with this design of One-Piece Crochet Cardigan. No, it has nothing to do with the One-Piece animation but it has everything to do with super comfy, lightweight crochet cardigan. The cardigan is crocheted from side to side, so the seams are only along the sleeves and sides. Plus eyelet rows throughout for that airy touch! This cardigan is super quick to make, and the end result is amazing. The pattern is written in row by row instructions, and is a great project for beginner who wants to make the first cardigan. There is not much shaping here other than the sleeves. It has been a very busy month for me since it is that time of the year , but I managed to finish the winter coat just in time. 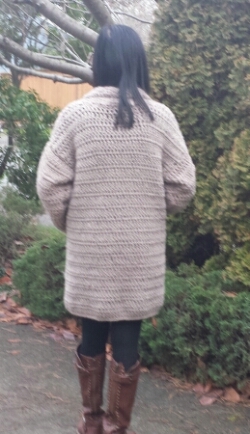 The coat is crocheted using chunky or bulky weight yarn so it is quicker to crochet. It is made of double crochet entirely, with some shaping at the shoulder and sleeves. 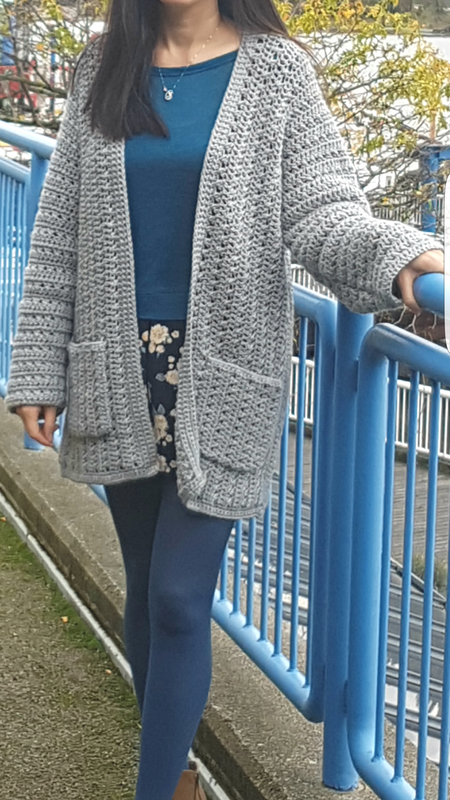 I made this coat using Loops and Threads Charisma yarn, with crochet hook N (9.00 mm). The coat gives ample warmth because of the thicker yarn, and with additional pockets to add structure to the coat and to keep your hands warm. The rolled collar is built in the coat itself, so there is no need of attaching separate piece to the coat. 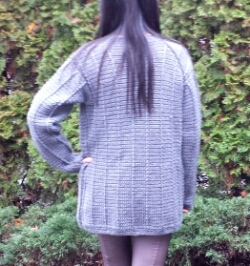 Just in time when fall is coming, I have just finished my newest design, Cozy Ribbed Crochet Cardigan. Inspired by ribbed knitting pattern, this cardigan features vertical ribs throughout. The ribbing helps the cardigan to maintain its shape, therefore it is a great pattern for a coat or jacket. Simple design with straight shapes but tailored at neckline and sleeves gives the cardigan its relaxed look with great fit. The pattern is simple and easy to follow, consisting of mainly single crochet and Front Post Double crochet. Once you make it you will want to make another one in different color! I made mine using Patons Canadiana yarns, but you can make it with any of your favorite worsted weight yarn, approximately 1650 to 2050 yards, depending in size, using crochet hook US J / 6.00 mm. I use three buttons, size 7/8″ in diameter in matching color, but you can use any style button in contrasting color if you like, such as cream color, or brown. Sleeve length is adjustable by folding it in , it will look great either way. As summer is coming to an end, I have designed a perfect fall shrug that is easy to make and stylish. 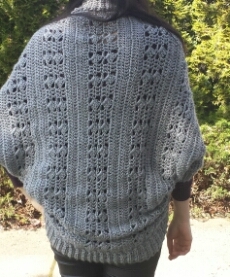 The shrug features easy slanted blocks pattern alternating with rows of double crochet that creates a unique pattern. As in most of my design, the shrug requires no shaping so it is perfect for any level of crocheter, from beginner to advanced. Accented with ribbed edging to give the shrug more of a stretch without losing its shape. Once you memorize the pattern it is fast to crochet. The shrug can be customized to sizes XS to 3XL . Length can be customized to longer or shorter. 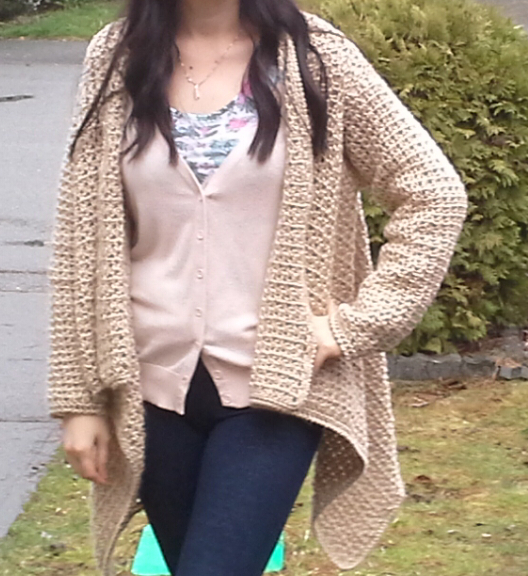 The shrug is made using worsted weight yarn such as Red Heart Soft yarn, with crochet hook J/10/6.00 mm and H/8/5.00 mm. 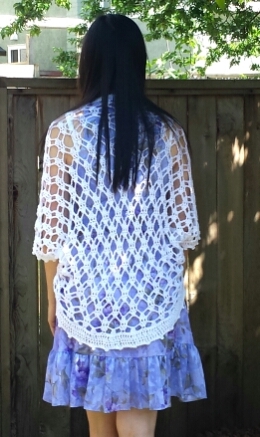 I came across this particular crochet stitch that I really like, so I decided to make a summer shrug using the stitch pattern. It creates a lacy, open shrug that is perfect as a layering piece to wear in breezy summer days. The shrug is made using cotton blend yarn, I used Cotton Fair by Premier Yarn , with crochet hook G (4.25 mm). It is fairly quick to make, and only takes about 600 yards for the medium size. The stitch pattern looks complex, but it is actually pretty easy, consisting of double crochet and chains. It gives the illusion of circles when stretched out. The pattern is based on a one piece design, so no shaping is required. Simple design is always great with crochet, it shows off the lacy pattern really well. The length is just below the waist, but it is easy to adjust the length by working more or less rows. 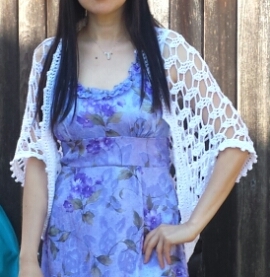 Picot trim accented the lacy shrug to give it more frilly look. Great to wear over for dresses, tunics and tops The pattern is designed for sizes XS fo 2XL/3XL. 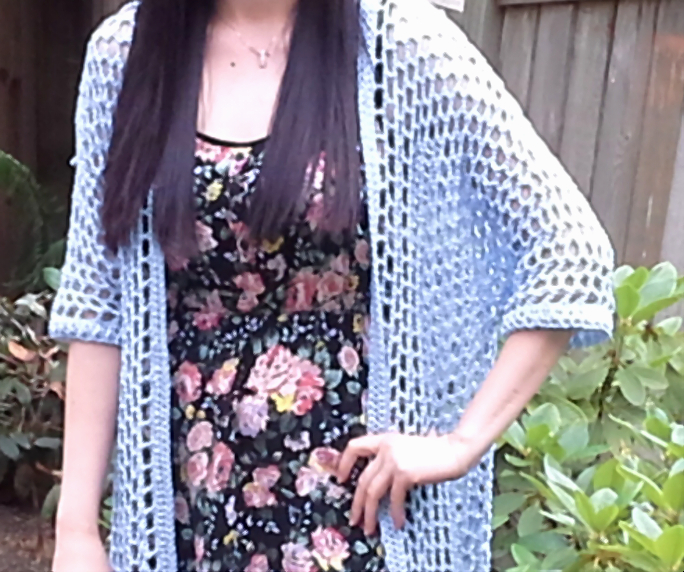 Summer is coming, and I have had a few request for crochet pattern of a light summer cardigan. 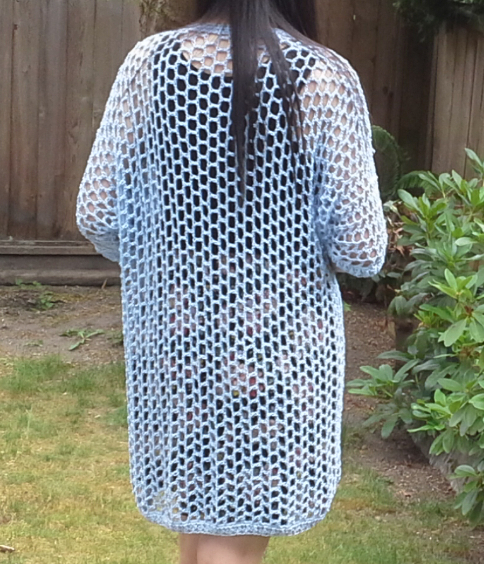 I had the honeycomb mesh in mind, I figured it would be perfect to design a cardigan using the honeycomb stitch. The pattern itself is fairly simple, easy to memorize and with rectangle shapes. The cardigan was made in three rectangle pieces, with the 3/4 sleeves crocheted into the armhole. 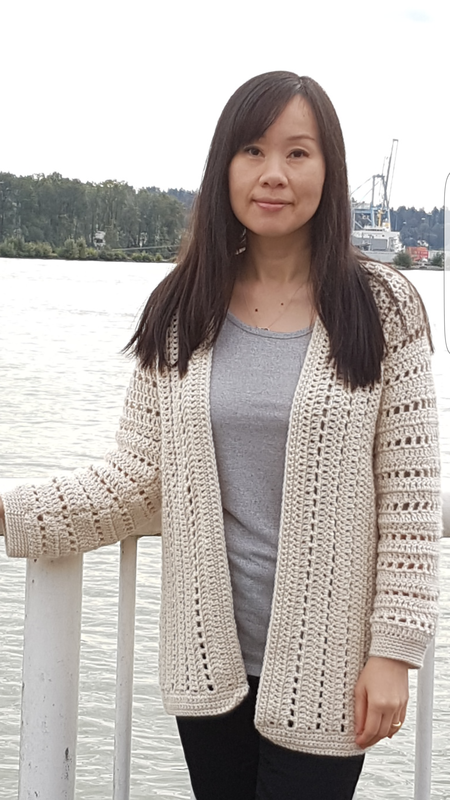 I made this cardigan using cotton blend yarn, which is perfect for warm summer weather. I use crochet hook size G (4.25 mm). It didn’t take very much yarn at all, for the smallest size it only requires about 650 yards. I am very happy with the end result, the cardigan drapes very nicely and with straight edges. I added ribbed edging on bottom and the sleeves. It is the perfect cardigan for layering on top of dresses, shorts, skirts, and even bathing suits. 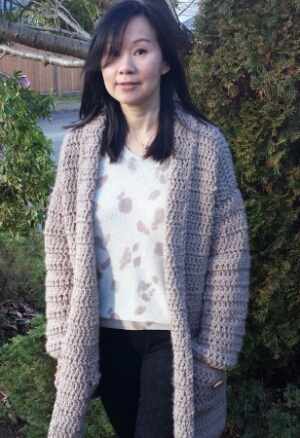 I finally finished my latest design, the V-Stitch Seamless Drape Front Cardigan. 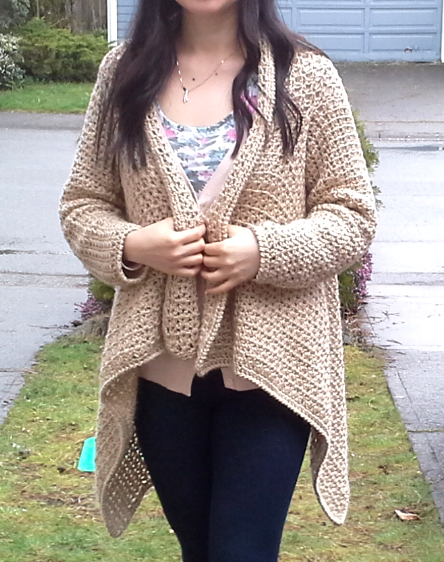 This crocheted cardigan is based on a rectangle shape with built in armholes. What makes this cardigan special is that it is completely seamless, so there is no sewing needed. I always liked as little seams as possible in my designs since it allows for more continuous pattern throughout as well as minimizing bulk. Crocheted garments are thicker than knitted ones so minimizing the bulk is something I always keep in mind when designing a crocheted clothing. The body of the cardigan is based on a simple V-Stitch pattern that is very easy to memorize. I love V-Stitch in particular among other crochet stitches because it looks great either horozontal or vertical as well as reversible. It also gives bit of airiness in the fabric without being too open. I use Caron Simply Soft worsted yarn in this design. I think this yarn works great here because of the slightly thinner yarn, allowing the garment to drape nicely in the front. This design is very flattering for all figures, with long, streamlined sides and straight back. The fit is relaxed for comfort, with long sleeves. The draped front can be closed when the weather gets cooler. The sleeves are slightly tapered towards the wrist, to give it a better fit. Overall this is a very versatile cardigan that goes well with a variety of outfits, especially jeans or leggings.